In purchasing equipment for the outdoors, I always use the same thought process. How often am I going to upgrade my equipment based on the new radical improvements that the manufacturer will come out with? How long before my existing equipment will become obsolete and I will have to replace it? How long will it be before I have a disadvantage with my existing equipment? When the time came to choose a camping lantern, I decided that I would choose the best camping lantern that I could afford based on the use of the camping lantern. Currently, there are candle, battery and gas lanterns available. How much room is available to carry the lantern. Are you backpacking, kayaking or car camping? Do you have extra room or can you afford the extra weight of batteries? Gas lanterns are not practical if you will be hiking. How much light do you really need? Are you also going to using a headlamp? If you decide on using a gas lantern, select a gas lantern that uses the same kind of gas as your stove. There are a number of different types of fuel available, including propane, butane, dual fuel, and kerosene. Gas lanterns are the brightest and intensive. The amount of light from a gas lantern can be adjusted by the flame. The gas lanterns will also last longer than the candle lanterns. Battery lanterns have focused, adjustable lights, too. 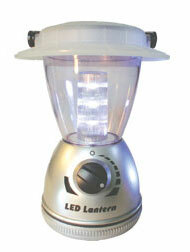 Battery lanterns don't respond well in cold and freezing conditions. Don't forget to learn how to maintain your camping lantern correctly because incorrect methods might damage your camping lantern and choose your camping lantern wisely.